This is it, consumers! The light’s at the end of the tunnel and we’ve arrived at the last big press conference for E3 2015. So here’s one last liveblog to see us out, with Square-Enix bring up the rear as the last but hopefully not least. The big bombshell of a Final Fantasy 7 remake was one of the highlights of Sony’s press conference last night, so it’ll be interesting to see if Square-Enix will be following up on that announcement with any more details in their own conference. One can hope, but it’s also possible that that’s all we’ll be hearing about it at E3 2015. Rumours have it that the Square-Enix press conference could actually be almost entirely focused on the Western market, meaning Square-Enix as publishers rather than developers. Deus Ex: Mankind Divided will surely make an appearance, and there may be another dose of the new Hitman Sony teased last night. Final Fantasy 15 and Kingdom Hearts 3 are looking a little less likely, with Square-Enix possibly saving them for the Tokyo Game Show that’s still to come this year. Any predictions of your own? We’d love to hear them! 6:05pm BST – Conference begins. Just Cause 3. Short trailer and that’s it? Hmm. Talking up Square-Enix’s change in recent years. Feedback and change, change and trust and feedback. Is having a guy with an English accent a requirement for E3 conferences? An hour long conference. Settle in, we’re almost there. 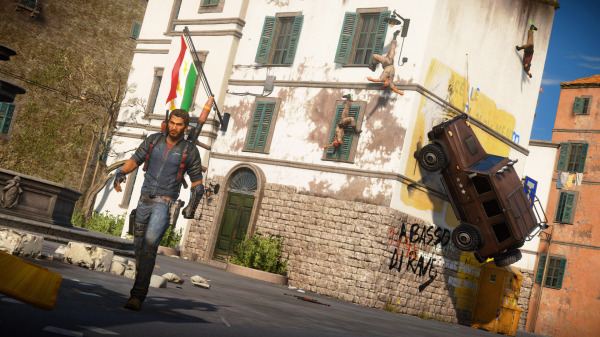 More Just Cause 3 talk! ‘People are still playing Just Cause 2! Thousands of them!’ Most of them playing the MP mod, I bet. ‘Enough from me…’ Yes. Thank you. Added a wingsuit to stabilise the parachute. Upgraded the grapple hook so it’s more like the cheat version that everyone used in 2! Multiple tethers at a time, can retract them as well. 400 square miles worth of game. Launching December 1st 2015, globally on PC, Xbox One and PS4. Liberate an island suffering under a dictatorship. Stop me if this sounds familiar. Did anyone play Just Cause for the story unironically? Do Just Cause things in Just Cause 3. Filled with ‘over 80’ land, sea, and air vehicles. Cool! 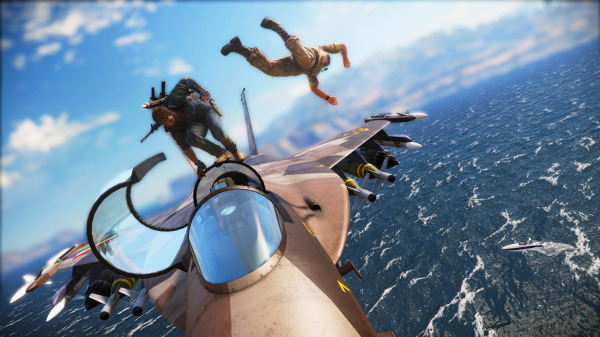 But who uses vehicles in Just Cause when you’ve got a parachute, grappling hook, and now a wingsuit? Oh wait, postapocalyptic. Lot of those games at E3 this year! More information in the Autumn 2015. For Ps4, production has just begun. Director of the project. He’s wearing a thing on his head. Oh those quirky Platinum fellas. He’s going to do his best. Do your best, director-san! Subtitle is a secret. (Read: They haven’t decided on one yet.) I’m going with Gibberish for now! It’s that trailer again again! Crystal Dynamics want to make believable characters. Eyelashes, pores on skin, etc. Does this make a character believable? Gameplay? Gameplay? Bueller? Nope, just how we made Lara Croft pretty. That’s what makes a game good, after all! It looks like those isometric-y Tomb Raider games, except not as good. Coming soon to phones and tablets. Challenging gameplay and nice music promised. Let’s hope they’re not just showing the trailer again. Really weird to bring out the Kingdom Hearts guy for this. ‘More this Winter’. Nope, that’s it. But the PC version port is coming this Winter! Hot damn! That’s what everyone wants to know about! Also an iOS version for the end of Summer. Uh oh. Looks like a handheld game. Kingdom Hearts fans are about to go rabid. Similar art style to the FF Theatrhythm games. 2D, sidescrolling action game. Kingdom Hearts-lite, anyone? Oof, that was some cold token applause. Don’t despair, it’s coming to America! Nuclear bomb narrowly defused. They playing with fire. I’m not even going to try and decipher Kingdom Hearts’ story at this point. There’s a keyblade. Sora’s in it. So’s Donald and Goofy. Goofy makes goofy noises. Heartless are still a thing. Neon trains, ships, teacups. The future is neon. Smug, baby-faced guys talking about light and dark. ‘Now in Development’. The wait continues. Sorry KH fans! Adorably familiar monster. Adorably familiar heroes and villains. Everything is adorably familiar. We’re serious, guys. Takes place in a very different universe compared to other FF games. Hiroki Chiba – Director of the game. Quick google search says he was involved in VII, VIII and X, as well as a bunch of more recent spinoffs. First time as a director. New gameplay that’s both easy to understand but also has some depth. Inspired to make a game especially for parents and their kids. Aiming for a 2016 release. Please look forward to it. This translator deserves a medal. Or a break. Whichever he’d prefer. Game that will grow over time. Will change things based on player feedback. Sounds like an ambitious continuation of that ‘create your own contract’ thing from Absolution. Hope it pays off. Core of the game remains the same. Go to fancy places and kill high profile people in cool ways. ‘High-definition sandbox where ever character has a name and every room matters’. This all sounds very nice but showing us that one image slide again and again isn’t achieving much. Okay, time for a gameplay trailer. Excellent. 47’s face looks different. And that’s weird. Targets teased that can only be taken on once. Once they’re gone, they’re gone forever. ‘World of assassination’. They’re pretty insistent on this. Will begin as a trial in December and gradually grow. Or at least that’s the idea. History lesson on the story of Star Ocean games. Didn’t it turn out it was all just an elaborate MMO to some super advanced alien race? Where do you go from there? That’s an odd subtitle if I ever heard one. Coming to North America and Europe in 2016, Winter 2015 for Japan. ‘Seamlessness’ a key word for the game’s development. Dynamic cutscenes and the more traditional static cutscenes. Want to prove JRPG aren’t movies instead of games. Temporary UI and other elements. Footage captured at 30fps, but they’re aiming for 60 for release. Same team, new game engine. Takes place in 2029, two years after Human Revolution. 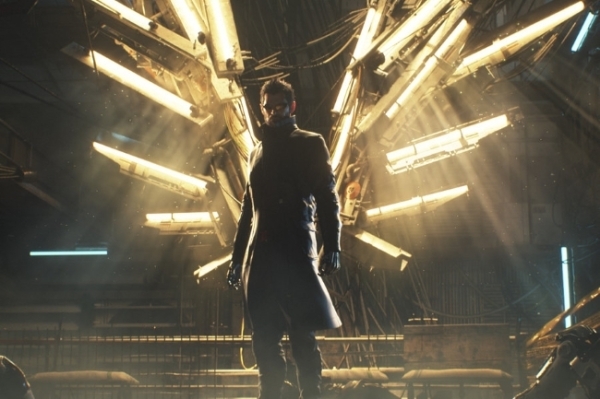 Adam Jensen is back but he’s changed. Mechanical augments have become outcasts, branded as terrorists, and are forced into ghettos. Left Sarif Industries and has joined a task force to stop terrorist attacks. Also a double agent, working to root out the Illuminati and stop them. New weapons and augments teased. Detachable blades used as projectiles. Player choice emphasised. Choices and consequences. Actions will influence the ending. As opposed to the traditional arbitrary choice at the end? Lip sync still looks super wonky. ‘2016’ release. Pretty non-committal. Apparently early 2016, but we’ll see. New project with a new studio. Tokyo RPG Factory. Dedicated to making JRPGs. Very pretty concept art, I’ll give them that. Not a spin-off or remake. Under development, planned for a global release in 2016. 7:20 BST – End of Show! Sadly that felt like a bit of a limp showing from Square-Enix overall. Giving most of their big trailers announcements to other conferences was probably a mistake in retrospect. But it wasn’t all bad! Finally got some concrete details about the new Hitman game, Mankind Divided finally got its moment in the sun, Kingdom Hearts III is still happening so fans can be happy about that (the ones in the crowd certainly were). But that’s going to do it from us at Need To Consume for this year’s E3 press conferences. Hope you got something out of it! Enjoy the rest of the content coming out of E3 and thanks for reading!